Zörk Pinholes extend Multi Focus System by offering the possibility of greatly increased depth-of-field with relatively little image degradation. The pinholes mount to the front of a standard enlarger lens with a simple adapter (included in the set). Each pinhole disk has an ultra-precise laser drilled aperture that greatly extends the depth-of-field of a standard enlarger lens. The pinholes are made of black anodized aluminum and coated with anti-reflective black lacquer to eliminate internal reflections. While Zörk Pinholes may work with some normal or even zoom lenses, we do not recommend this application. For best results, we recommend using pinholes with a high quality enlarger lens, such as the APO Rodagon series. The pinholes may also be used in conjunction with our Makroscope aspherical close up lens. The Zörk Pinholes come in a complete set of 3 pinhole disk and include a mounting ring that threads to the 40.5 mm front thread of a Rodenstock Rodagon lens. The pinholes may be used with other lenses by using a step-up or step-down ring. The Zörk Pinhole mounting ring quickly threads into the front of an enlarger lens that is mounted to the Multi Focus System or Mini Makro Mount. Pinholes may be easily interchanged, allowing you to select the proper size for the depth-of-field you wish to have. 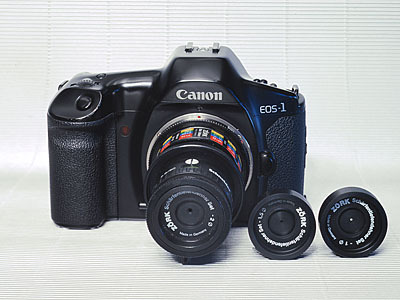 The effective aperture is obtained simply by dividing the focal length of the lens by the diameter of the pinhole, e.g., an 80mm lens with a 2mm pinhole produces F-40. Most current cameras with TTL exposure metering will correctly meter exposure at the working aperture provided by the pinhole and lens combination. Aperture priority will continue to operate on most cameras, with the camera setting the correct shutter speed relative to the selected pinhole. How much does the pinhole reduce the amount of light coming through the lens? 2 mm pinhole > between 1/8 and 1/60 sec. 1.5 mm pinhole > 1/4 to 1/30 sec. 1 mm pinhole stop > 1/2 to 1/15 to sec. How much depth-of field does each pinhole allow? For comparison purposes, an enlarger lens focused at infinity and stopped down to F-22 will have a depth-of-field range from approximately 5 ft. (1.5 m) to infinity. You can significantly extend the depth-of-field range by applying tilt with the Multi Focus System. 1. To avoid corner vignetting, always keep the iris diaphragm of the enlarging lens fully open. 2. Make sure the hole of the pinhole is absolutely clean. Small pieces of dust or debris may adversely affect sharpness or resolution. 3. Always focus on a significant detail in the subject, such as a contrasty highlight area. 4. In macro mode, always focus with the pinhole in place. 5. Use the self-timer or mirror lock up to reduce the affects of camera vibration.